I’m saying thanks today. Thanks you, and you, and you in the corner. Thanks you, all of you, for everything. For the last 5 months (it’s hard to write that, actually) we’ve been in absolute crisis mode at my house. In early March, my daughter started throwing up. And throwing up, and throwing up, and throwing up. I figured we were in the middle of a winter stomach flu, like every other kid we knew. From the time school starts in September to the time we finish in May, my kids always get at least one major flu. It’s just part and parcel of being a kid. But after a week of my Sofie throwing up around the clock, we went to see the pediatrician. The doctor ran a few tests and sent us home. It was the flu, we were told, so we went home to ride it out. Halfway through week two of round-the-clock puking, we went to Instacare. Sofie was throwing up between 10 and 15 times a day. 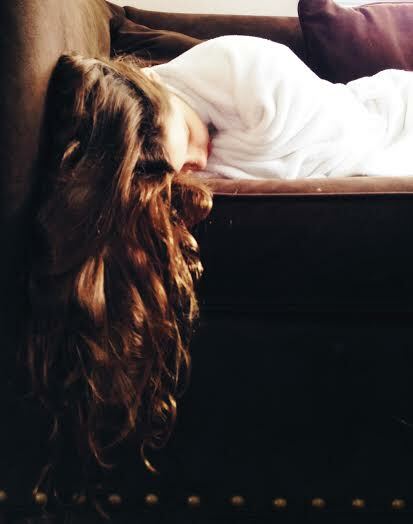 She had lost 10 pounds in 14 days, she was pale and listless, and I was officially worried. The doctor at Instacare took 8 vials of blood, ran 2 bags of I.V. fluid, and sent us home. School was out of the question. My girl was up all hours of the night and day, vomiting over and over, and over again. She slept with a puke bowl next to her head and ran to the toilet constantly. I wasn’t sleeping, my girl wasn’t sleeping and we got run down really, really fast. I know how to do long-term sickness better than anyone, sadly, so I did what I do, and started making lists. I did research in-between work, and ran the house like a general. We borrowed dozens of movies from friends, went to the library to check out stacks of books, had friends bring home homework from the Junior High, loaded up on Gatorade and ice cream, and got into a basic sick-kid routine. Sofie and I got up every day and did the same thing: get my little guy off to 3rd grade, push meds, push hydration, watch movies. We tapped companionably side-by-side on our laptops while we watched every movie known to man, until my son came home and we all left for afternoon swim practice. Then it was dinner(ish), and bedtime. 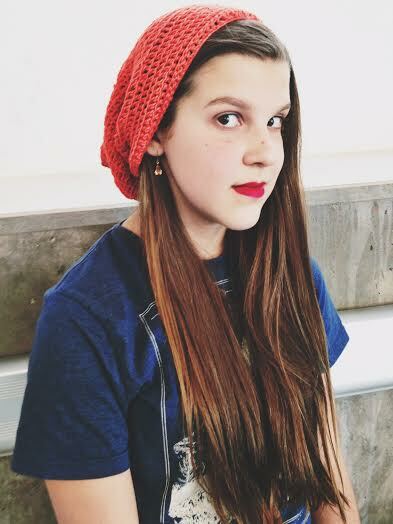 A finished waiting room crocheted beanie! 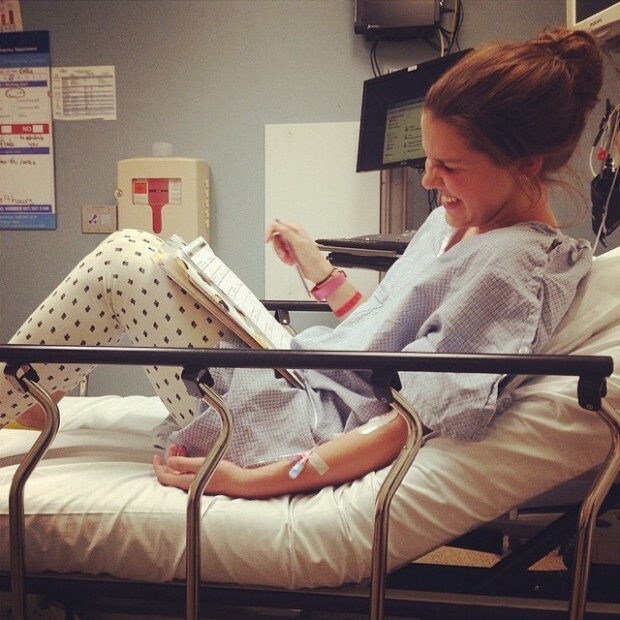 About every other week, we went to the Emergency Room to get re-hydrated with I.V. fluids. Sofie did homework and annotated books while I made bad jokes about teen pregnancy (every.single.doctor. ran multiple pregnancy tests. That got old pretty fast.). That’s while she’s giggling in the photo below. We live near one of the world’s best children’s hospitals Primary Children’s Hospital, where over the course of several months we met with almost every pediatric specialist available. Our pediatrician called almost weekly at the end of his workday, to check in and offer comfort and new theories about what this illness could possibly be. We tested, and tested, and tested some more. DNA tests, obscure autoimmune blood tests, MRI’s, CAT scans, CT scans, gastric emptying studies. 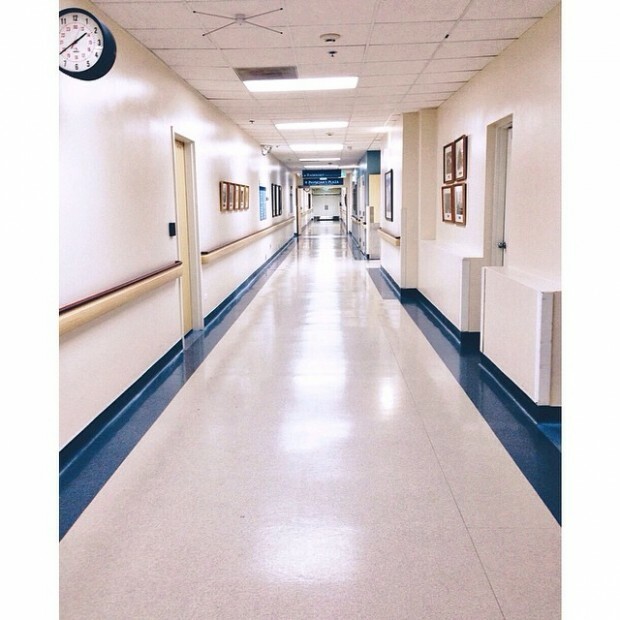 Every day was filled with specialists and nurses and blood draws. Sofie remained calm and collected. She stayed on top of her homework, dragging books and tests and math homework everywhere we went. 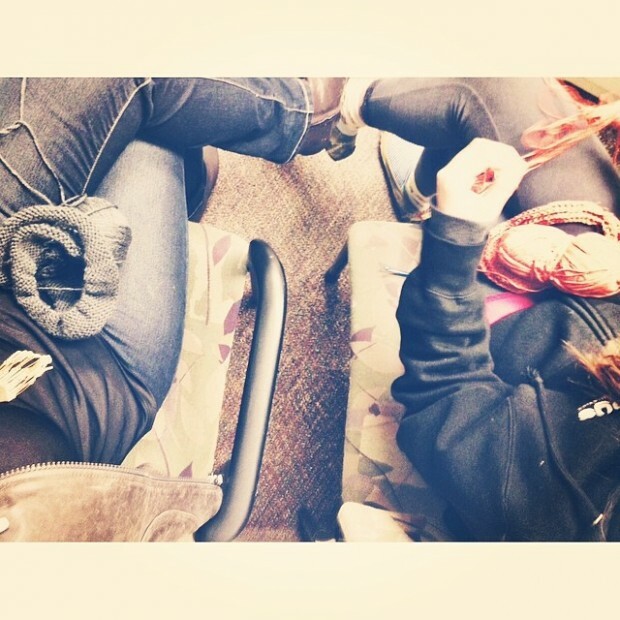 We became friends with the nurses and doctors in the E.R. I hauled my laptop around with us, meeting deadlines by working through middle of the night urgent visits to the emergency room, in the dark of hospital rooms while my baby was infused and medicated. At some point, I hit my limit. I cried myself to sleep every night in order to keep a brave face for my girl during the day. I figured somehow, some way, there had to be a lesson in this. What was the point, if there wasn’t a reason? I’m not sure there’s a reason for suffering, but sometimes life needs a silver lining. So I decided it was time for hope. Hope and love and universal kindness and support. I reached out to all of you, asking for help and good vibes from across the globe. I started a hashtag called #HopeAndLoveForSofie. 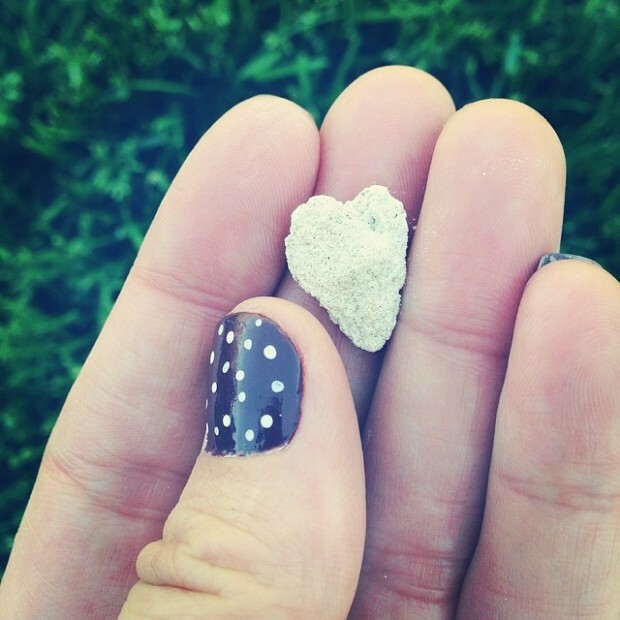 Every time I found a heart, anywhere, I posted a photo on Instagram and Facebook and Twitter. I knew Sofie needed some outside encouragement so I asked the universe to send us hearts, and happiness, from everyone. And hundreds of you responded, taking photos of a heart in your morning coffee, heart shaped clouds and leaves and shrubs, hearts in the sand with Sofie’s name in the middle. Hearts from all sides of the world. 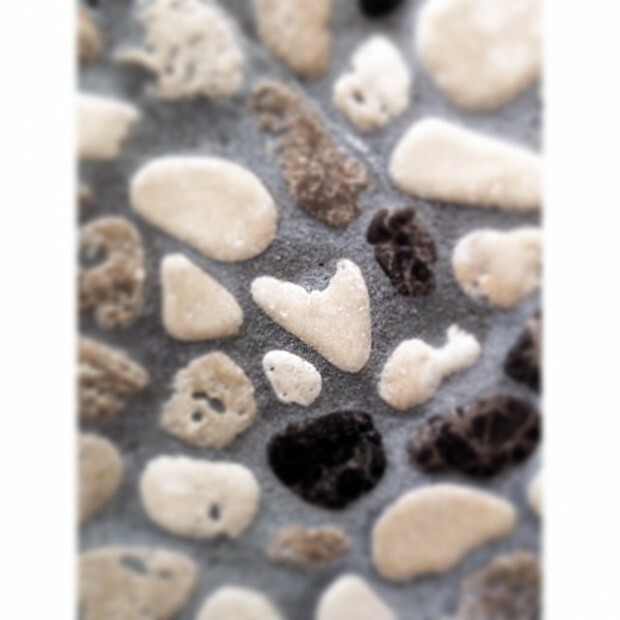 Hearts in the floor tile of my master bathroom shower. 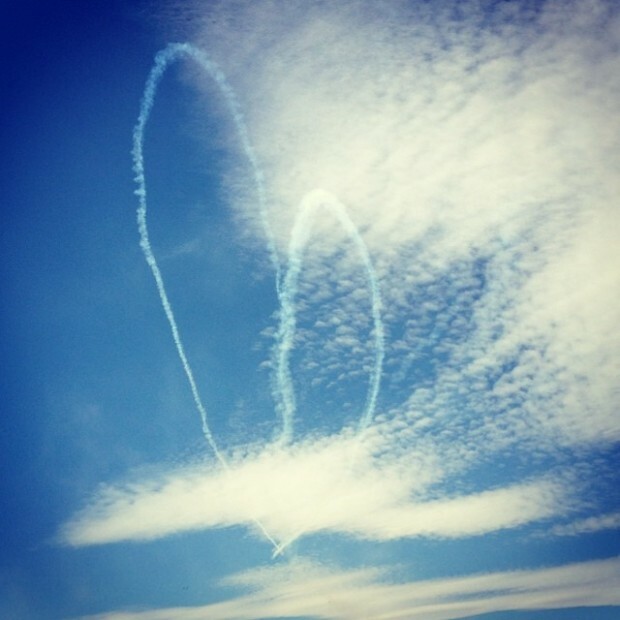 My friend Kirsten found a heart in the sky at an air show. 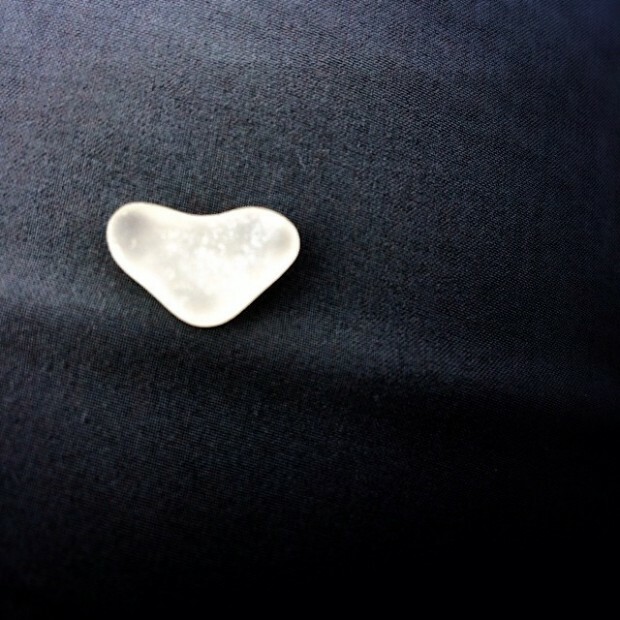 My friend Ruth found a sea glass heart. 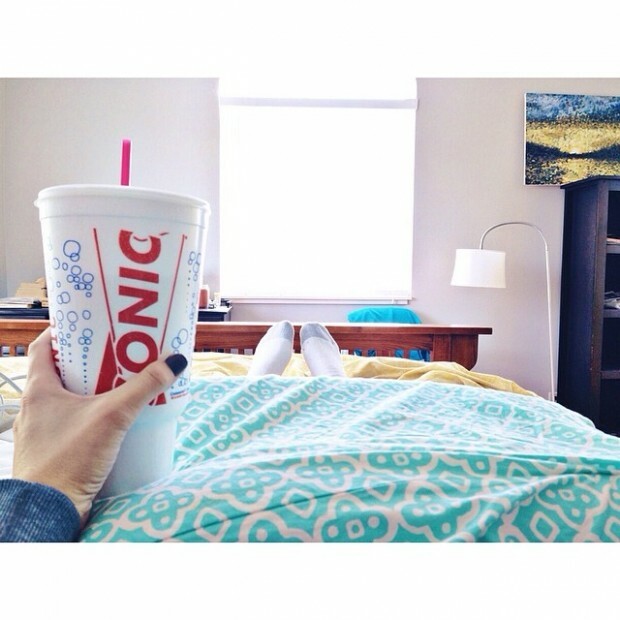 Happiness, all around. 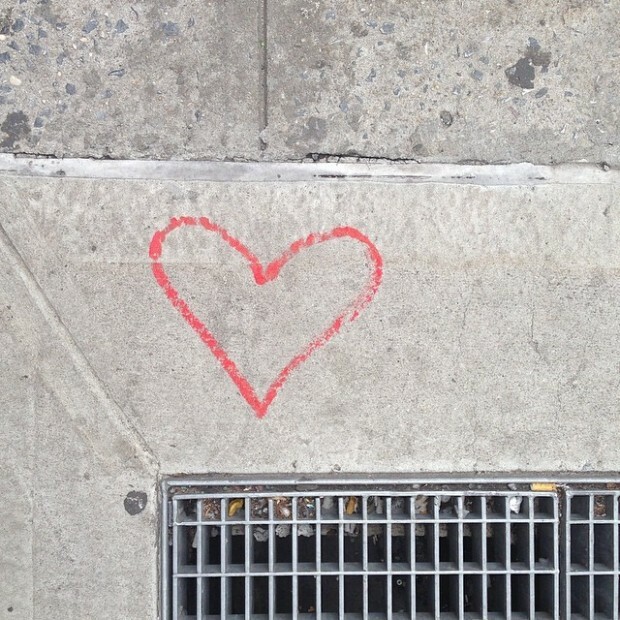 Sidewalk graffiti heart in Chelsea, NYC from my friend Kris. 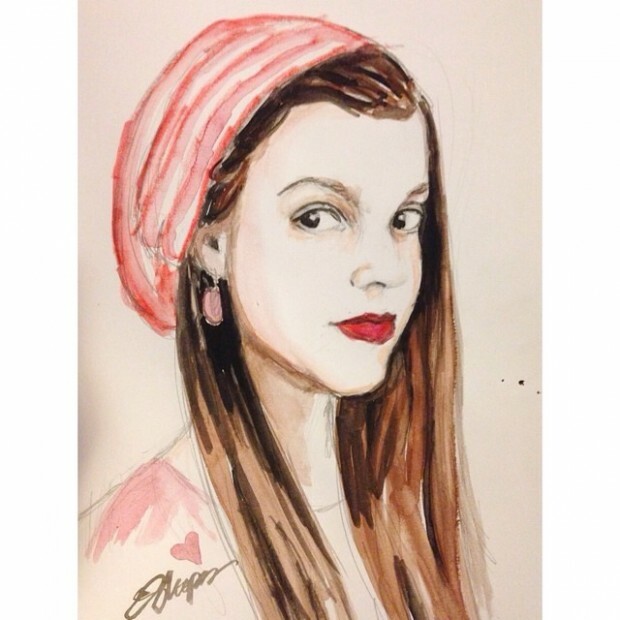 My friend Erin painted a photo of Sofie, with a heart in the corner. My friend Ez has been finding them everywhere. 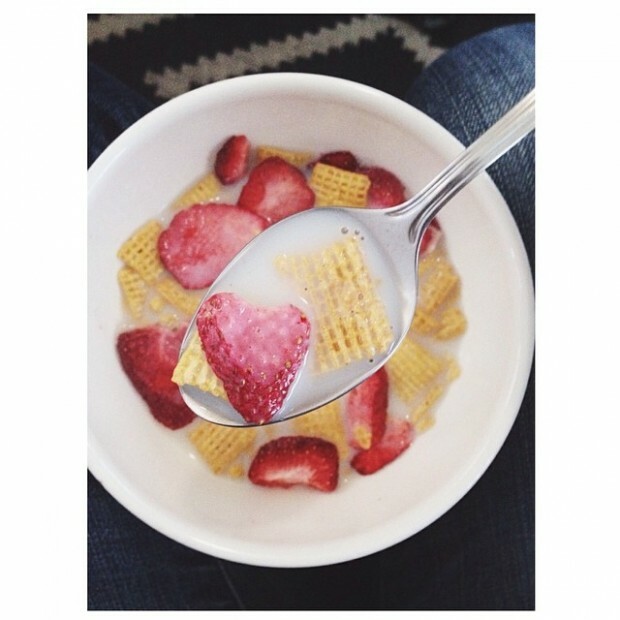 This was her daughter’s breakfast cereal (a daughter who’s coincidentally the same age as my daughter). My back-door-neighbor and friend Ellen ‘heart attacked’ all our windows during the night, the day after I asked all of you to find hearts. A lot of you sent packages and goodies to keep my girl sane. Notes, emails, FB messages, and hearts poured in and we definitely felt #HopeAndLoveForSofie. So thanks. THANK YOU. Muchas gracias. Danke. Ddziękuję. It means so, so much. It’s teaching my girl that when you need help, it’s okay to ask. That people are mostly kind and amazing, and looking to help the rest of us out. That when it’s her turn, when she’s well, she will know what to look for, and how to help those who don’t know how to ask for help. These are massive life lessons for anyone to learn at any age, let alone 14, and you’re to thank for that. It’s a big deal, and I’m forever and ever grateful, amen. We’re still struggling, big time. We’re 5 months into this illness, and we’re all tired. We’re worn down, we’re tired and discouraged. The house is a mess. I’m holding on to my routine and my work and my life by a thread. A tiny, little thread. We have entire days where we all just cry. Because it’s not fair, and we don’t have answers, and we’re done. Nada MAS. I routinely get in bed at the end of the day (6:30 pm after swim) and just sit. I lie back with a frosty cold caffeinated beverage and read terrible books from the library. I look at the ceiling and try to find answers in the textured paint. I haven’t found any so far, but it hasn’t stopped me yet. I’m eternally optimistic; always have been. So thanks my friends. Thanks to all of you, strangers, friends, new friends, acquaintances, old friends, family. THANK YOU. It redeems my faith in humanity that you’re all out there looking out for one another, and for those of us who can’t quite look out for ourselves. If any of you are interested, my dear friend Nancy has set up a job chart of helpers. It’s basically a job chart, anyway. Email Nancy at: Rally4Sofie@gmail.com if you’re interested in helping from a-near or afar. Nancy is a dream come true and is lining up all manner of help while we can’t do it ourselves. Thank you, all of you, for being made of magic and wonder. I love you. We love you. THANKS. I check in with you all the time, thinking I’ve missed an update, thinking I’ve missed an explanation. There are only so many times and ways I can tell you that I’m thinking of you, but I am. Never have I found you so beautiful than now when I can see your daughter in your face. When I can see your strength in hers. The coolest heart I ever found. In the bottom of my tea cup after I poured in some water to drink. Tea stain heart. About a year ago when I couldn’t see very far in front of me with my twins being just under a year, another toddler, and a kindergartner. By the way, after you read the first post, just keep clicking on “newer post” to read more. Sorry it’s not more searchable. This is my first time visiting your site, and I could not read your story and not leave you and your sweet girl a message!! 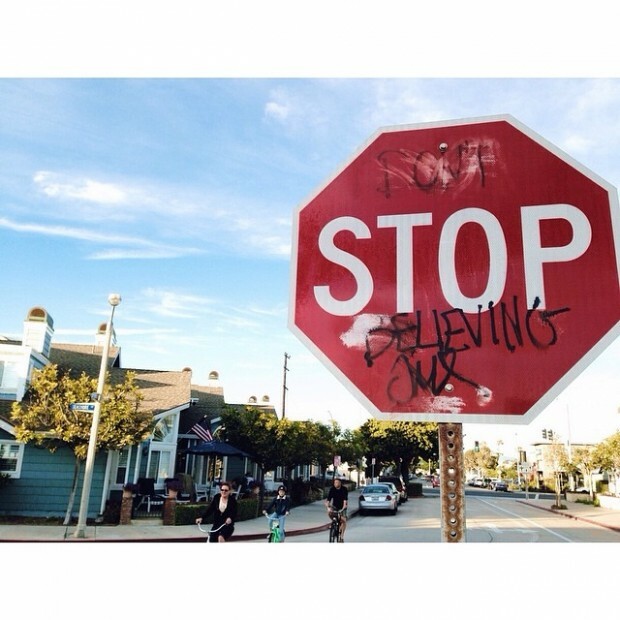 You will overcome this difficult time, I 100% believe that. I will be praying for you, your daughter, your family/friends and the doctors that are taking care of your angel. If God brought you to it, He will bring you through it. I totally feel like I know you from reading your blog! I’ve seen you or your kids around town before, but always been too chicken to say hello. I’m strange like that I guess. Just got linked up on your helping app though so you will be meeting me soon! We are practically neighbors too! Small world. Sending prayers and love to you and your girl! I hope you get answers soon! I am so, so sorry that your family is going through all of this and praying that you get answers soon. Sending all my love to you from Indiana! I can’t imagine how hard this has been on you all! thinking about you guys, keep seeing hearts everywhere … hoping you find an answer and a solution soon. Huge hugs to you and my girl!!!! This is a wish for hugs and blessing to come your way for dear Sophie. What an ordeal! How many trials can a family have? Not fair. Anyway, we love you all and will pray for you. Hope the answers are soon coming. Has anybody checked to see if she is Addison’s disease? My Mom had that with lots of vomiting and loss of electrolytes. She also had frontal lobe epilepsy, which sort of confused her symptoms. Also diarrhea and other unpleasantness. Took forever to diagnose. You might ask about it. wow! 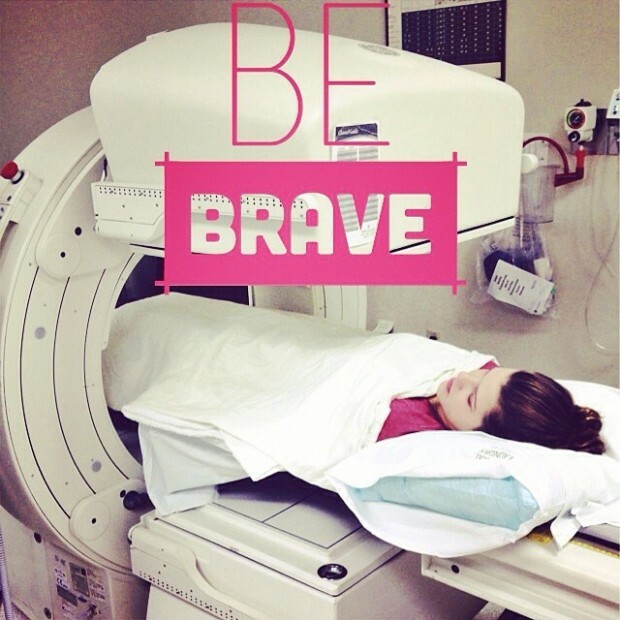 this was truly inspirational, i am the same age as sophie and i can’t stand hospitals and illnesses, i wouldn’t have lasted if i was her, you should be very proud that she has been going through this like its nothing, i would break down! lots of love and hugs.. I tread easy when saying things like this, but if you are open to asking Angels for help call on Arch Angel Michael. He is the bomb diggity, and i’m asking him to become mortal so I can marry him…LOL :) In all seriousness – the CLEAR answers that he gives you along with darn near instant peace of heart is nothing short of miraculeous!! His powers are divine, as fast as any woman could hope for and CLEAR! If you happen to come across a blue feather – know that he is with you and WILL grant you peace. Hello! My name is Rachel, and I am 18 years old. My heart breaks into a billion little bitty pieces for your daughter. 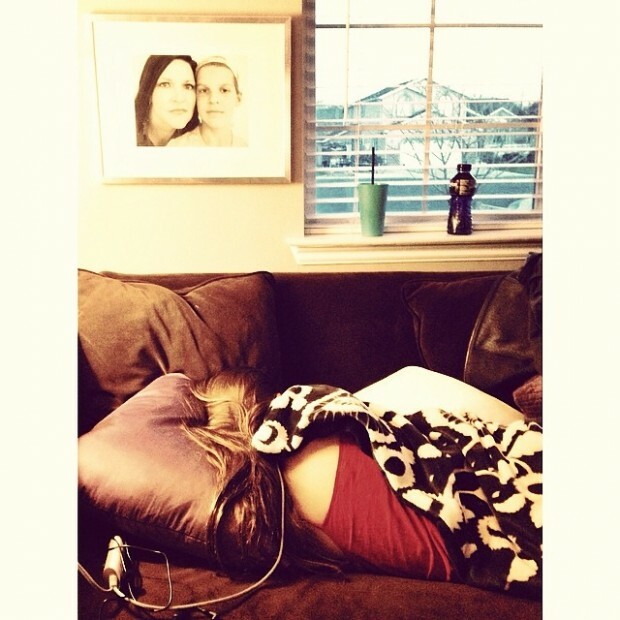 Chronic illness is the most terrible, horrible thing for a teenager. Trust me, I know. 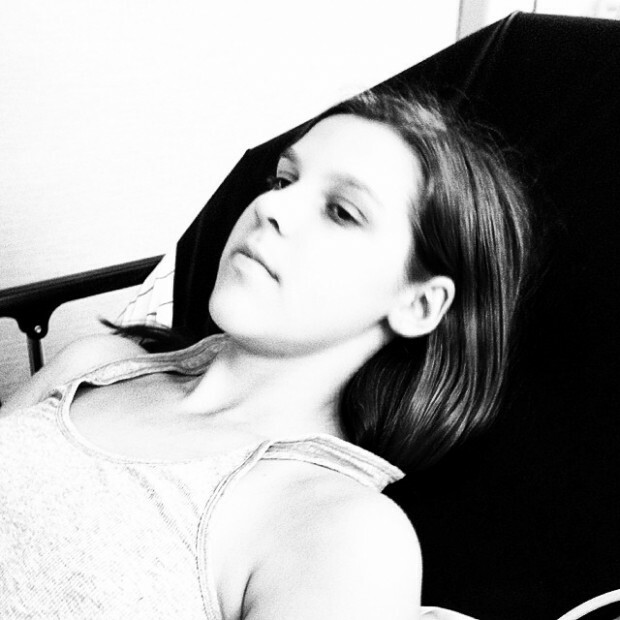 Like your daughter, I started having tons of health issues at age 14. I wasn’t vomiting, mind you. But it was literally 4 years of unanswered questions, staph infections, cellulitis, horrible cysts all over my face, and a run in with a vaccination that almost left me septic. 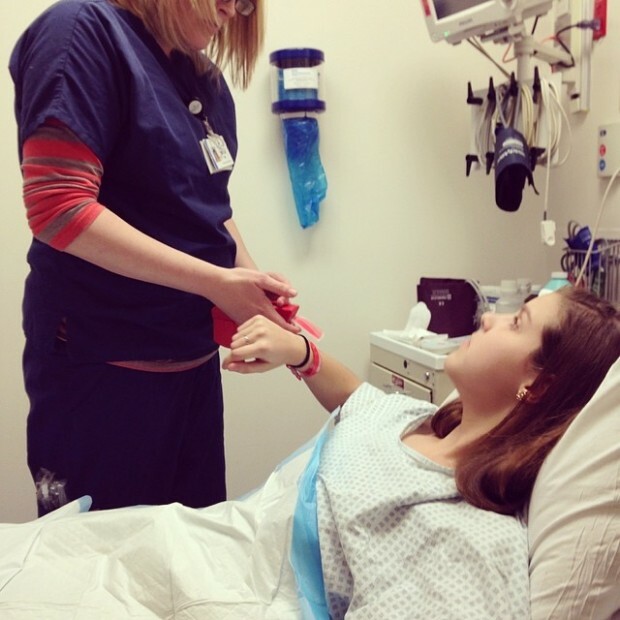 Fruitless trips to the ER, pediatrician, and urgent care constantly. Anyway, I say that to say that I know doctors can be extremely helpful and wonderful, but when you’re chronically ill and no one can tell you why, as a teenager, they feel like the enemy. Only 4 months ago was I finally diagnosed with Lyme Disease that had gone undetected for soooo long, slowly making me more and more miserable. Since I’ve been on the antibiotics, I haven’t been nearly as sick as I was. I’m very weak, but grateful my questions have been answered. I pray you and your daughter find the same. I know you probably have advice flying at you from all different directions, both warranted and unwarranted. May I suggest, as someone who’s been there, finding a Lyme Literate Medical Doctor for your doctor. You’ll have to ask around, because they are hard to find. But, they are a God-send. Pediatricians and Primary Care Doctors know nothing about Lyme disease. Four years ago, Lyme disease was the last thing I imagined was causing my problems, because I never had a “bulls-eye” rash, and I never saw a tick on me. But I came to find out that Lyme disease causes hundreds of different symptoms, most of which we ignore. I know that Lyme disease does indeed cause vomiting and nausea. My blood test for Lyme from my primary came back negative, but my Lyme doc took one look at me and said “you definitely have Lyme”. Here is a good article on the subject. http://www.truthaboutlymedisease.com/faq.html Chronic illness the most frustrating thing to ever deal with, so I totally get it. I read something once that said, “I wouldn’t wish what I have upone anyone, but no one gets it, until they “get” it.” And that totally strikes as true with me. Please, please don’t hesitate if your daughter ever needs to talk to another teen with chronic illness, because I know sometimes I just wished I had someone my age who didn’t think I was crazy! Lol. I will be praying for you and your daughter and your entire family in this tough time!